The return of NFL football kicks into full gear this week and begins with a battle between the Houston Texans and the Carolina Panthers. Preseason games are a time for teams to find out exactly who will be playing for them, whether it be specialists, rotational guys, or full time starters. Below, PFF’s team of analysts have all the most important position battles and players to watch during today’s game. Anytime there is uncertainty at the quarterback position, that instantly becomes the position to watch for a team in the preseason. That’s especially the case for this game as one of the more decorated college quarterbacks in recent memory will receive his first taste of NFL game action. Recent reports have indicated that Savage, who is slated to start the game, has been impressive the first few weeks of training camp. In 143 snaps in 2016, Savage had an overall grade of 68.8. While a sample size of 80 dropbacks is too small to draw conclusions, Savage fared better when under pressure than when kept clean. Under pressure, Savage had an adjusted completion percentage of 83.3 percent and a passer rating of 89.9. With a clean pocket, Savage’s adjusted completion percentage checked in at 64.4 percent, and recorded a passer rating of 75.9. This will be an interesting trend to monitor through the preseason. Having traded up for the 12th pick to draft Watson, he’s obviously the quarterback of the future in Houston. The question to be answered is if the future starts now. Watson’s overall grade of 89.8 in his last year at Clemson was second among 2017 draft-eligible quarterbacks. While he has earned praise from his head coach, like all young quarterbacks there are areas of growth that can be built on in preseason games. 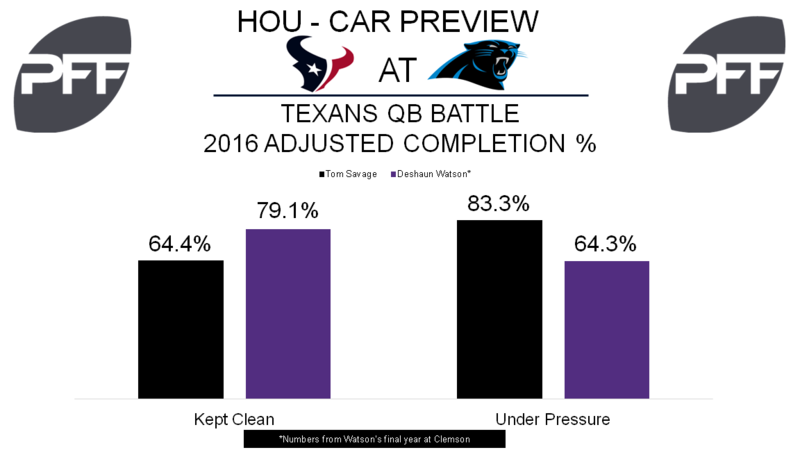 Like Savage, Watson saw a drastic difference between when he had a clean pocket and saw pressure. In a clean pocket, Watson recorded an adjusted completion percentage of 79.1 percent and a passer rating of 106.3. When under pressure, his adjusted completion percentage dropped to 64.3 percent and a passer rating of 87.6. The figures when under duress still sit near the top of 2017 draft-eligible quarterbacks, but watching Watson get acclimated to the NFL game could be one of the top story lines this preseason. With Will Fuller breaking his collarbone in training camp and out for an extended period, the Texans now need to figure out who will be lining up opposite DeAndre Hopkins. Two players who they’ve spent third-round picks on figure to be playing for that opportunity. According to the unofficial depth chart the Texans released leading up to this game, Miller is the next man up after Fuller. Known for his conversion from quarterback to receiver at Ohio State, Miller’s rookie season was cut short due to a shoulder injury that landed him on injured reserve. After playing in 379 snaps and recording a grade of 43.1 in 2016, Miller is reported as being much more comfortable entering year two. With another offseason to get familiar with the receiver position, Miller’s progress is worth monitoring. Strong, who is coming into 2017 leaner, played 299 snaps in 2016 before being placed on injured reserve with an ankle injury. Coming off a second year where he posted an overall grade of 48.7, some outlets have called this third season a “make or break” campaign for Strong. The opportunity to show both the Texans and the league what he’s capable of starts Wednesday night. For various circumstances, the Texans first team offensive tackles will be worth monitoring in preseason game one. With Derek Newton still on the PUP list rehabbing from two torn patellar tendons and longtime left tackle Duane Brown holding out, new starters with be at both tackle spots in this game. According to the unofficial depth chart, Lamm will have the first crack at winning the right tackle spot, while Clark will be filling in for Brown. Logging time between left and right tackle, Clark was in for 1,219 snaps for the Texans last season. In the process however, he posted a grade of 41.6 that was the lowest of his career. Clark did post a serviceable run blocking grade of 76.0, but ranked a not-so-nice 69th pass blocking efficiency of 91.4 and for his overall pass blocking grade of 35.3. Lamm, who is entering his third NFL season, played just 167 snaps in 2016. In that span, he recorded a grade of 58.8, and a pass blocking efficiency of 93.8. The unofficial depth chart indicates he figures to get the first crack for the right tackle opening, but Breno Giacomini will be competing with him for the role. If you’re watching the second half of this game, Cunningham is a linebacker to watch on the Texans defense. 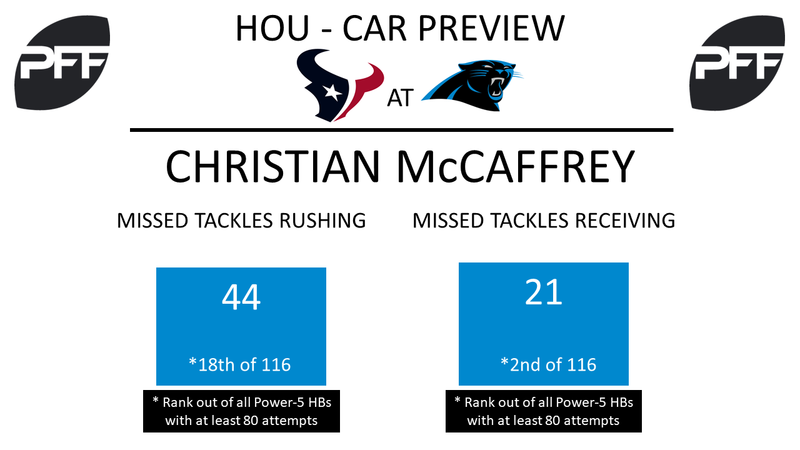 The Texans second round pick this past April, Cunningham figures to start the year behind both Benardrick McKinney and Brian Peters, but should see snaps in this contest. In his last year at Vanderbilt, Cunningham posted an overall grade of 83.4 and stood out in run defense, where his grade in 2016 was 85.4. Cunningham’s run stop percentage of 14.7 percent was fourth among all 2017 draft eligible inside linebackers. One attribute to keep an eye on is how efficient Cunningham is in terms of tackling ball carriers. Cunningham missed one tackle for every 6.7 tackles in 2016, A figure that didn’t compare well with some of the other top inside linebackers in this class. It will be interesting to see even early in his first preseason if that’s an aspect of Cunningham’s game the Texans have been working on. With QB Cam Newton being eased into training camp while recovering from offseason shoulder surgery, the offensive line, especially the tackles, will be extremely important to the Panthers success this season. The biggest battle among the line is third year tackle Daryl Williams and rookie Taylor Moton fighting for the starting right tackle position. Williams started 10 games last season at right tackle and played the second most snaps among the Panthers’ tackles, playing 647 snaps after playing only 83 in 2015. He was graded at 70.3 overall, the highest graded tackle on the team, but struggled in pass protection with the 13th lowest pass blocking grade (64.6) in the league among qualifying tackles last season. His 30 total pressures allowed were the most by a player to allow one sack or fewer, leading to a 93.7 pass blocking efficiency rating (47th in the NFL). However, Williams is expected to have first chance at the starting right tackle position based on experience. After being drafted in the second round of the 2017 draft, Moton will push Williams for the position after having a lot of success, albeit against lesser competition at Western Michigan. 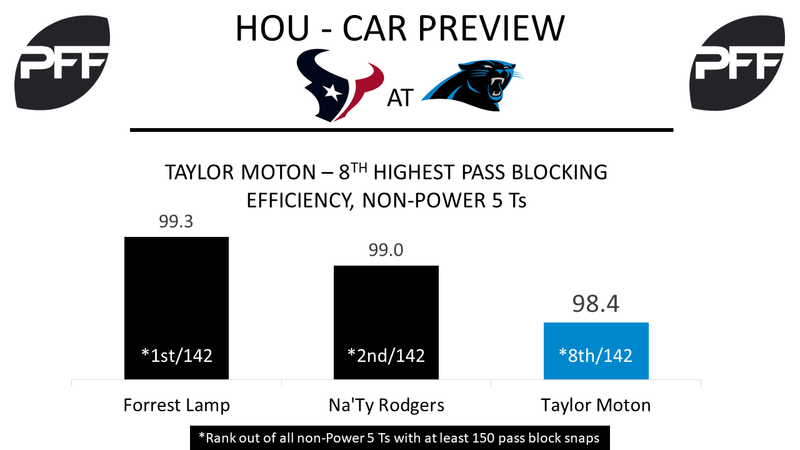 Moton did not allow a sack and only allowed eight total pressures in 427 pass blocking snaps including never more than two in a game. He excels at pass protection, with a 98.4 pass blocking efficiency which was 13th highest in the nation last season. The rookie will have to show he can produce against NFL caliber competition as he acclimates to the league. Kawann Short recently signed his big contract extension but Star Lotulelei was drafted ahead of him in the 2013 draft. Lotulelei’s rookie contract will be up after this season and he started off his career very well with a grade of 81.1 overall. But he has yet to reach that grade since then and his run defense has fallen every year. The former Utah Ute’s 1.7 percent run stop percentage in 2016 ranked last in the league among 75 defensive tackles. Now he is looking to return to his rookie form this season. He’ll have competition for his position because the Panthers drafted another defensive tackle in the first round just last year. Vernon Butler was unable to play much last season due to injury, only 226 snaps, but when he was on the field he outperformed Lotulelei. Butler had more stops (5) in the run game than Lotulelei (4) while playing nearly a third of the snaps, 83 snaps for Butler and 230 for Lotulelei. A healthy Butler should be able to push Lotulelei for playing time or even give the Panthers a three-headed monster inside. The Panthers released the previous starter at left tackle, Michael Oher, after he failed a physical prior to training camp, so Matt Kalil has the chance to take control of protecting Newton’s blind side. The team is hopeful that when healthy, Kalil can return to his rookie form when he had the sixth highest pass blocking efficiency in the league among tackles (96.8). Since allowing only 23 total pressures in 2012, Kalil has allowed more than 40 pressures every year that he has played more than two games. With the interior of the line solidified after a down year, Kalil can show the team that he is healthy and answer one of the questions at tackle early in the preseason. After a late start to the offseason program because of Stanford’s rules, Christian McCaffrey has not seemed to miss a step and is being raved about each practice. He was one of the most electric weapons in college, his 3.25 yards per route run in 2015 was the highest PFF College has ever recorded (since 2014) by a running back and he’s forced 150 missed tackles over the past two seasons. He’s also only fumbled three times in 631 career carries, showing off his dependability. He should be a versatile chess piece out of the backfield the Panthers can utilize all over the field.